For a while now Netflix streaming has been a staple of our movie & television content consumption. I’ve always been impressed with how Netflix has tried to get ahead of the digital revolution and not depend on its DVD distribution business. So, I was extra impressed when I saw that Netflix was going to be producing their own content to be streamed exclusively via Netflix’s streaming service. 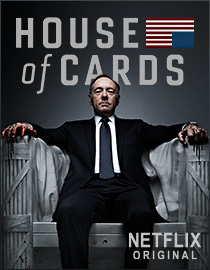 The series House of Cards debuted on Netflix on Friday. Instead of dripping out an episode a week, like normal television channels, Netflix is putting it out all at once so you can binge on all 13 episodes, as is normal with watching TV shows on Netflix. House of Cards stars Kevin Spacey as ruthless Congressman Frank Underwood. You get to see as his character wheels and deals to get his agenda accomplished in Congress and throughout Washington, D.C. If you aren’t completely cynical about the state of corruption and back room deal making in DC, you’ll be completely cynical after watching House of Cards. Everyone’s doing a favor for someone else. Everyone’s trying to manipulate someone else. One of the interesting roles in the story is by actress Kate Mara who plays Zoe Barnes. She’s a lowly reporter that meets Congressman Underwood. He uses her as his mouth piece. She uses him to advance her career. What’s interesting is there depicting Zoe as the 20 something reporter who blogs and uses Twitter. They try to hard to depict a reporter of the new era. Net net, it’s an incredibly entertaining show. It’s like West Wing meets Homeland. It’s great to see Netflix really hit it out of the park with this next evolution of their model. I’m excited to see what else they com up with for original programming. If they put out enough of these shows, I think they’ll give the currently unsubscribed a reason to subscribe. Next Next post: People Flock to DC. Can DC Keep Up?